– in progress, so what you’re reading here is just my initial research plus a bit of the beginning of the making. I will add more over time as I make progress on the costumes! Please also note that, as described below, I make these costumes for my son, myself and my father. I am NOT selling them. I’ll just start by admitting that I am not a gamer. 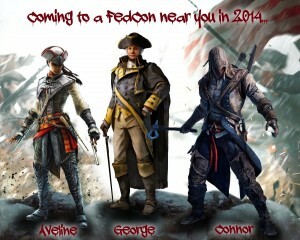 So that is not my connection to the Connor, Aveline and George Washington costumes. I do not have any wish to be an “assassin” either. In fact, with my rather pacifistic nature, I’d more enjoy being the exact opposite. I have also never seen myself as a “cosplayer” (and actually even hate being called that!). A cosplayer, in my opinion, is a person who actually pretends to be the character whose costume he or she is wearing; either by imitating their poses or by actually even talking like the characters would. This is not what I ever did. I just enjoy making costumes (which actually makes me a costumer, not a cosplayer! ); and for the sake of not letting the costumes I make rot away in a dark closet, I occasionally wear them and smile while doing so – which isn’t really pretending to be the character. So “wanting to cosplay” (which is probably leet speek for “wearing a costume and trying to behave like”?) Connor or Aveline wasn’t my motivation to even just start on these costumes – just the sheer joy of creating complex stuff; though I am perfectly aware that these costumes live and fall with the appearance and behavior of their wearers. And yes, I’m perfectly aware that some people will probably consider me to be TOTALLY mean because I hate the term “cosplay” so much; particularly if it’s used the wrong way for the costume itself instead for wearing / posing in a costume. The expression “I’m working on my cosplay” is, IMHO, wrong if you’re trying to say that you create clothing or prop items; because in that case you’re working on your costume which you can later wear to”play”; but you’re not “working on your cosplay”, which would be standing in front of a mirror or audience and practicing poses / expressions (and should, again IMHO, be called “practicing my cosplay”). Well never mind me, I’m probably just one of those cranky old women (who, incidentally, has been sewing way longer than many of you who may read this have been alive). However, one fine night in (I think) April or May 2013 I accidentally stumbled upon this article about Rick Boer, his wife and their Connor / Aveline costumes. Now, I had seen a gazillion Assassin’s Creed costuming *attempts* before – something a costumer who is connected to the internet simply cannot avoid! – but ALL those attempts were about “costumes that came fresh from the sewing room”, with little to no weathering / aging at all – which just doesn’t work for these costumes; Assassins LIVE in their clothes for years, and the clothing looks like that. The photos in that article, seriously, made me analyze them very carefully. I wondered how much was photoshopped in those pictures. Imagine my surprise when even the most thorough examining did not show any traces of photoshopping except perhaps some color adjustment for the HDR effect. To me, it was a moment that is difficult to describe – breathtaking? Awe? It’s hard to imagine that I actually stared at the photos from that article (for which I googled larger resolutions and different shots as well) for several hours after discovering the initial article. At any rate, after examining the costumes as well as the makeup, it became evident to me that those weren’t just costumes; they’re carefully painted works of art. Even if there are some differences between those costumes and the actual Assassin’s Creed costumes – yes, there are! I could list them but don’t want to unless I would be asked to do so by Rick himself, lol! – they are still the most realistic and recognizable Assassin’s Creed costumes that I had seen up to that point. Note how I avoid saying that they are the best *made* costumes I have ever seen. Rick would probably agree that, well, the stitching in some places could be better, for example. But the impression the *entire* costumes with their wearers leave behind is that they just stepped out of the game – which is a highly desirable appearance for any costumer. When that first night of discovery was over, I woke my son and showed the pictures to him. BIG mistake. Oh well. What can I say? I’m not just a costumer, I’m also a mother. At that time however I was over my ears in making our costumes for Star Wars Celebration Europe. Also I already knew that when I had finished those costumes, I would want to take a break from Star Wars costume making. An idea was born; and I’ll spare you the fact that my initial idea was “Connor for myself, Edward for my son and George for my father”, and how my son and I discussed for DAYS why he would be such a better Connor and I would be a better Aveline than what I initially had planned, lol. However, there was still the sheer mountain of work that the costumes for Celebration Europe represented for me; so I seriously had to FORCE myself to NOT research the Assassin’s Creed costumes and / or possible material choices until Celebration Europe was over. And actually that didn’t completely work for me – each time I think I deserved a short break from the Star Wars costumes, I took a closer look at promotional game images as well as screenshots and, while doing so, collected the ones that “told” me most in terms of construction and materials in a folder on my harddisk. I also created a bookmarks folder for websites that offered proper materials.